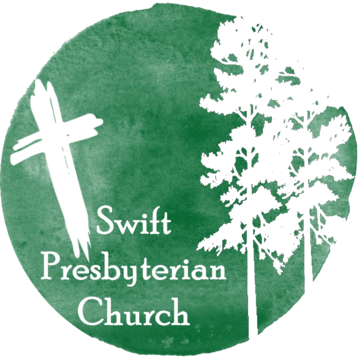 We want your news that you think would be of interest to our Swift Presbyterian Church family. Please feel free to submit it on our news and photo submission form. Thank you. What we’re doing . . .
Judy Walker, one of our two office assistants, was recognized for five years of service as a church employee. Five young people from Swift Presbyterian Church attended the Montreat Youth Conference June 3–9 at the Montreat Conference Center in the North Carolina mountains near Asheville. Swift Presbyterian Church honored its 2018 graduates on May 6 at the 10 a.m. worship service in the sanctuary. A reception followed in the fellowship hall. From left are William Vanbrimmer, Jessica Gosa, Philip Melton and Sarah Kleinschmidt. William, Jessica and Sarah have been awarded high-school diplomas and Philip received a certificate in congregational leadership from the University of Dubuque Theological Seminary in Dubuque, Iowa. Thank you, Brandon, for your service to the residents of Foley. Swift Church member Brandon Irwin has been recognized as firefighter of the year for 2017 in the city of Foley. He and five other outstanding local public employees were honored at a special lunch and awards ceremony Feb. 16. The Vosloh Charitable Foundation, established by Sue and David Vosloh in 2008, and the Foley Rotary Club sponsored the event. Other award winners were: Angela Hayes, Foley Elementary School teacher of the year; Kathy Kendrick, Foley Intermediate School teacher of the year; Cain Harbin, Foley Middle School teacher of the year, Cain Harbin; Col. Scherry Douglas, Foley High School teacher of the year; and School Resource Officer Labron Williams, Foley Police Department’s officer of the year. The honorees received a $1,000 bonus from the Vosloh Foundation, with taxes being paid by the city of Foley and the school board. The recipients also received certificates from Gulf Chrysler-Dodge-Jeep and Moyer Ford in Foley, offering them the opportunity to purchase a new vehicle at dealer cost with no markup. Recipients were given a chance to speak with the audience as well as revealing what they will do with their $1,000 bonus. Foley Fire Chief Joey Darby introduced the Foley firefighter of the year, Brandon Irwin, who has been on the staff since Darby joined the team nine years ago. Darby said that when he came to Irwin’s nomination, the shift supervisor had made points that were not at first obvious, as Irwin is a person who often does not want to be at the front, staying behind the scenes instead. Irwin grew up in Foley and began volunteering around 2005 before getting the chance to join the staff full time, and he hasn’t looked back since. Irwin says that he hasn’t spent his money yet, but there has been talk in his home of a family vacation. The award ceremony closed with statements from Mayor John Koniar. The Vosloh Foundation was created originally to give bonuses to the Foley officer of the year and the Foley High School teacher of the year after a survey done in the city resulted in those being the positions voted by the public as most difficult. Over the years and with additional contributions, the foundation has been able to expand the award to now include teachers of the year from all four Foley schools as well as the police officer of the year and firefighter of the year. The Vosloh Foundation has been partnering with the Foley Rotary Club to present the recipients with an awards ceremony lunch since 2012. The foundation’s goal is to have enough funds to make these awards guaranteed indefinitely. Our newest members are Bill and Pat Rickert. They worshiped with us several times and joined the chancel choir. They are Foley residents and formerly were members of First Presbyterian Church of Gulf Shores. Both served as elders there. The Rickerts are originally from Michigan. ►See the faces of others who joined the church recently. Here’s the church. Here’s the steeple. Open the door and see all the people. This is what makes a church. ►The most recent in the gallery is Cadi Cardwell. Click here to see photos from some earlier baptisms, too. Snapshots from here and there . . . If you are the parent or grandparent of a Swift Church child who has received honors at school, please let us know by using the news submission form on the website.